White label daily deals platform and TC Disrupt finalist ChompOn is releasing some interesting data today comparing the value of shares, Tweets, likes and follows in the context of e-commerce. Using data from the sites that it powers daily deals for, ChompOn examined the conversion rate and action for deals shared on Facebook and Twitter. 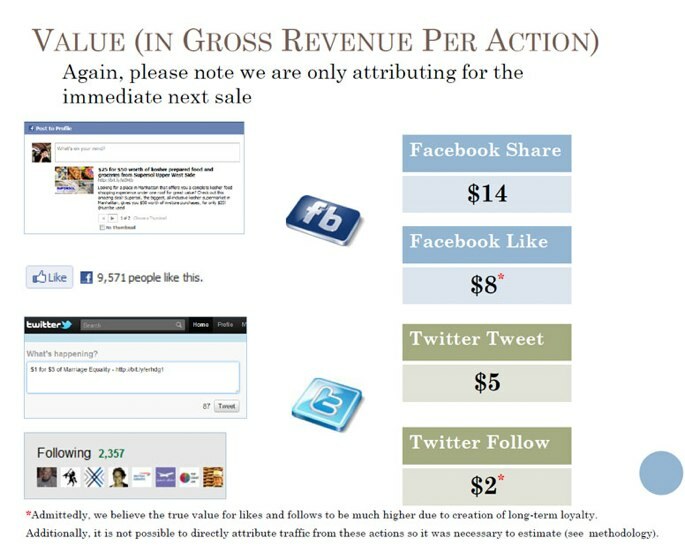 According to the startup, the value of a Facebook share is $14 and the value of a Tweet is $5. For shares and tweets, ChompOn was able to directly attribute sales to the original action and took the total revenue attributed to each action and divided it by the total number of shares/Tweets. ChompOn is working with 50 partners including Blackbook Magazine, JDeal and the wine vertical of flash sales site Beyondtherack, to power Groupon-like crowdsourced coupons. By comparison, ChompOn says the value of a Facebook like is $8 and the value of a Twitter Follow is $2. For likes and follows, ChompOn estimated attribution by looking at traffic references and subtracting out purchases made through shares/Tweets as well as purchases made through direct traffic. Of course this data is a bit tenuous and anecdotal. And it’s important to note that this analysis does not capture the long-term value of customers over time. We’ve seen other data that shows the higher value of a Facebook share over a Tweet. Eventbrite recently reported that a share with Facebook friends results in $2.52 worth of ticket sales whereas a Twitter share is only worth $0.43. As we wrote back then, Facebook and email most closely match your real friends. In the context of events, this produces better conversions. But it’s interesting to see that in terms of commerce, Facebook again provides a higher value than Twitter in terms of conversions.